The Path Taken is a prototype developed in Flashpunk over the course of 11 days (originally planned for 7 days). In this game we wanted to model the feeling of regret and “the grass is greener on the other side” mentality. You play as Ward, a boy going through a rite of passage in a dungeon and learning a few things about life along the way. When we were brainstorming we went over a few ideas and eventually came across the idea of choosing multiple paths. However when choosing a path the player would have to make a hard choice and whatever the player choose it would have to seem like the wrong choice. We thought we could literally do this by having the other path visible but inaccessible so the player would be able to see what they had missed. We also wanted the game to have permanence and every time the player chose an action even if they started the game over the choice would persist. We decided to go ahead with the idea but quickly ran into numerous design challenges. First of all, we had to make sure the branching didn’t get too crazy so that we could finish within the week. However the choices the boy had to make were unclear. We wanted a choice where the boy could either choose a girl or an upgrade to his sword. If you chose the sword something bad would happen to the girl as you saw her in the other room. If you chose the girl she would restrict your movement and some places couldn’t be explored (like in Passage by Jason Rohrer). However this choice didn’t seem particularly strong. The moral choice would always be to choose a life over material gain. We decided to think the choices over again but didn’t get too far. Instead, we thought about other ways to simulate the feeling of regret. One way we did this was attempting to go along with player’s expectations of a dungeon crawler game but then subverting these expectations. A huge influence on this was The Legend of Zelda games. One way we thought about this was to have monsters that you felt bad for killing. We decided on a slime monster that was relatively harmless. If the player decided to kill it, it would die a gruesome death. 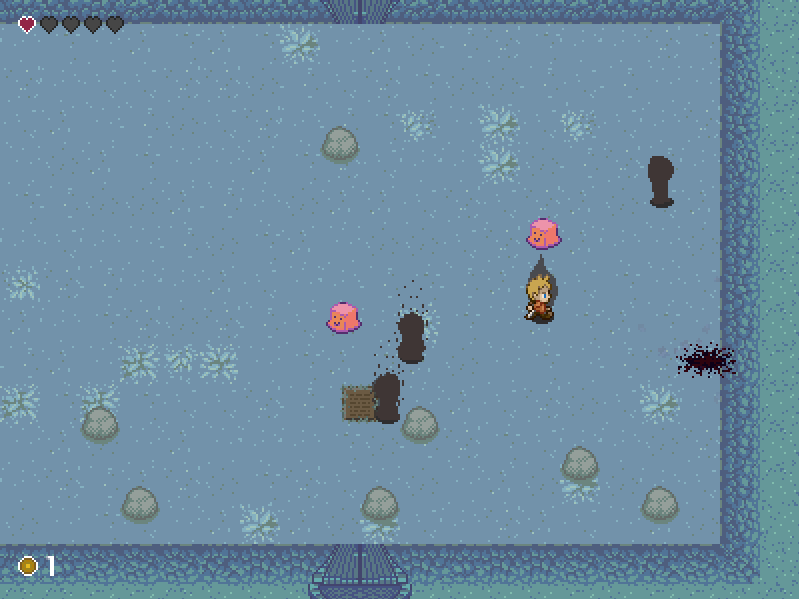 If you kept killing the slimes, the other slimes would slowly change their demeanor and grow more aggressive. We also changed the design from taking different paths to choice the player would have to actively make. For instance if the enemy dropped money and the player collected it, then later in the game the player would drown if they attempted to cross a river. We also thought about the shoveling mechanic in Zelda games and decided to explore the mechanic further in terms of our theme. We liked the idea of burial and sort of the responsibility of burying ghosts. This seemed to mesh well with the story of a boy going through a rite of passage. Perhaps the dungeon the boy is exploring is a temple of his ancestors and the trial involves taking care of the temple. All the while we were trying to implement the features we still weren’t exactly sure about the design of the game. We also ran into pipeline problems again with The Path Taken because a lot of the work ended up as programming work. It became clear that there was a lot of design problems that needed to be addressed before we could move on in the game but there was already a large amount of programming work that still needed to be done. In the end we decided we needed to halt production and move on. Game Feel: Mike was able to program the mechanics of the game so that they felt right, which was essential to move the design of the game forward (but we ran out of time in the end). Art: Dan was able to get a lot of of the sprite work in pretty quickly which helped contribute to the overall feeling of the game (as seen by his talk on art direction here). 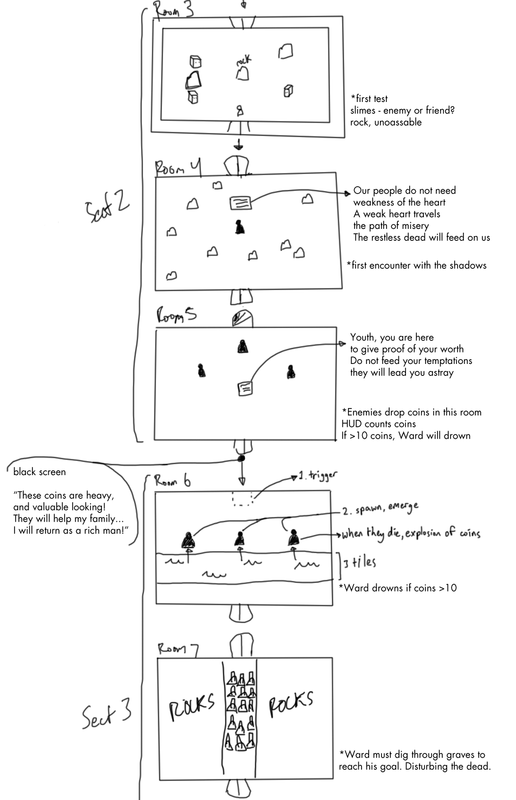 Some Design Ideas: Felix was able to design a bunch of interesting puzzles that emphasized the player’s choices in game that played with their expectations of the dungeon genre. Our design ideas were interesting but there was no time to implement a majority of them. We were also able to think about how players usually approached the dungeon-genre and how we could subvert those player expectations. Scope: We overscoped what could be done in a week. We were aware of the complications but ended up falling in the trap of the programming bottleneck. Focusing: In hindsight it probably would have been stronger to narrow down on one mechanic and tried strengthening that instead of introducing more and more mechanics as time went on in order to try and cover up weak concepts. The Path Taken was a very good example of a game that wasn’t well suited to rapid development. However in a sense it was successful as a prototype because we could see where the game was going and how we could develop it further. It was also useful to see common threads dungeon-exploring games usually have and subvert them to play the player expectations. Overall The Path Taken was an interesting experimenting but it definitely needs much more time if we are to develop it further.